Photograph: Western Exhibitions Installation view of "John Riepenhoff: Handler" showing works by Tyson Reeder, left, Greg Klassen and Michelle Grabner, 2011. John Riepenhoff founded Milwaukee’s Green Gallery in 2004, in his attic, when he was only 22. In some ways, “Handler,” which opened earlier this month at West Loop gallery Western Exhibitions, seems like a typical Riepenhoff project. It highlights artists with Wisconsin ties, such as Michelle Grabner, chair of SAIC’s department of painting and drawing, and Scott Reeder, subject of the Museum of Contemporary Art’s first “Chicago Works” exhibition. Living in Milwaukee, a city proud of its working-class history and socialist mayors, has made the artist-gallerist particularly conscious of the labor underlying the art world. “I can’t look at a painting without thinking about all the structure around it,” he says. While most movies end with a long list of credits, he adds, museums and galleries rarely celebrate “who stretched the canvas,” much less who hung the painting or promoted the show. When asked why the art world keeps its laborers behind the scenes, Riepenhoff says, “I think it’s an unspoken etiquette. I’m not really sure.” The reticence presumably stems from the tie between an artwork’s value and its authorship. Though it’s commonplace for artists to rely on assistants and fabricators, a work by Jeff Koons has more appeal than a work by Jeff Koons and his army of support staff. It’s also easier to exploit people who are invisible or whose jobs are poorly understood. Last summer, Sotheby’s in New York locked out its 40-plus unionized art handlers and replaced them with scabs because of a contract dispute. At press time, the handlers are still picketing outside the auction house. Riepenhoff didn’t know about the Sotheby’s protest when he planned “Handler,” but the show refers, in part, to his own past jobs as an artist’s assistant and art handler. The clothes “all represent different biographies, like different stages in my relationship to art,” he explains. The legs supporting Greg Klassen’s painting (pictured) are clad in the gray jeans and Vans that Riepenhoff wore when he and Green Gallery co-owner Jake Palmert renovated their current primary exhibition space: a former drive-through dry cleaner on Milwaukee’s East Side. As artist Tyson Reeder looked at his “Handler” painting during the opening, he suggested that the piece has more “kinetic energy” on a pair of legs (wearing an outfit from Riepenhoff’s stint at New York gallery Gavin Brown’s enterprise) than it would on the wall. 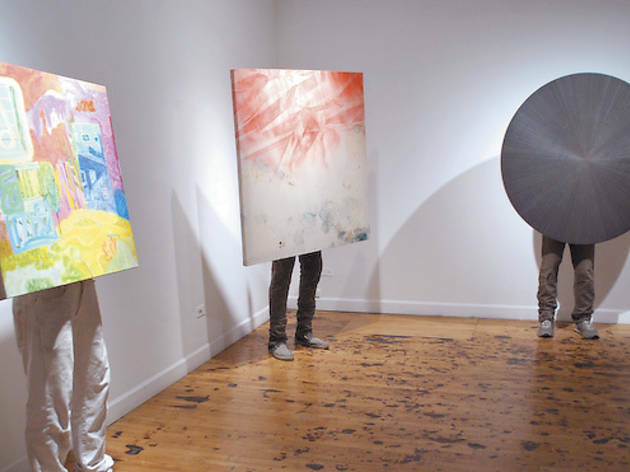 The show’s conceit reminds viewers that someone decided where to put the art they’re looking at. 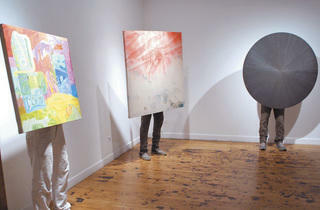 “Handler” and “Plein Air Paintings” run through January 21 at Western Exhibitions.